Let’s talk about this Tempeh BLT with Sriracha Tahini. Aside from it being my new favorite sandwich of all time, it’s incredibly easy to make and takes less than 1/2 an hour. That’s including the made from scratch sauce too! I am a HUGE fan of homemade sauces. Most prepared vegan sauces sold in stores tend to be pricy and sometimes include ingredients like additives or preservatives. I’s so simple to make your own, why not give it a whirl? This Sriracha Tahini really elevates the flavor of these Tempeh BLT’s in a way I can only describe as heavenly. This Tempeh BLT also gets it’s flavor from sweet, smoky glazed tempeh bacon. I like to cook it in a skillet for this recipe as the maple syrup forms this blackened glaze on the tempeh that tastes SO DAMN GOOD. A crunchy, flavorful vegan version of an American classic. Smoky glazed tempeh and spicy sriracha tahini give this sandwich tons of flavor, you won't even miss the bacon! Slice the tempeh into long, thick strips. Combine all other ingredients in a medium container with a lid. Stir well. Toss the tempeh in the marinade. Cover and let sit for 10 minutes while you prepare the sriracha tahini spread. In a skillet over medium high heat, grease the pan with the coconut oil. Add the tempeh and drip the leftover glaze on top. Cook for 4-5 minutes, carefully flipping the tempeh bacon pieces so each side is evenly browned. Set aside to cool slightly. Soak the cashews for 2 hours or overnight and drain. To speed this process up, keep soaked and drained cashews in your freezer or boil the cashews for ten minutes to soften. In a high speed blender or food processor, combine all ingredients and process until smooth. Stop occasionally to scrape down the sides. Sriracha Tahini will keep in an airtight container in the fridge for up to five days. Layer each sandwich with 1 large romaine leaf, 1/2 tomato (sliced), and 1/2 an avocado (also sliced.) Evenly distribute the tempeh bacon onto the 4 sandwiches. Stack them up, cut them in half, and enjoy! Lightly toast the bread. Spread 1 tablespoon of sriracha tahini on each slice. This recipe is gluten-free if you use bragg's aminos or tamari and gluten-free bread. This Tempeh BLT with sriracha tahini has completely taken over my tastebuds. I’ve eaten it literally four times this week with no end in sight. The Sriracha Tahini recipe makes enough for way more than four sandwiches (depending on how thick you pile it on) so put it on everything! Pro Sandwich Tip! To keep this sandwich crunchy if you’re taking it to work or on a picnic, cut the romaine leaf in half and place half each half on a slice of bread. Then top the lettuce with the Sriracha Tahini and finish building the sandwich. The lettuce will keep the sauce from soaking into the bread. Now go forth and picnic! Did you try this Tempeh BLT with Sriracha Tahini? Leave us a comment below and tell us how it turned out! Better yet – post of photo of your sandwich to Instagram with the #carrotsandflowers 🙂 We love it when y’all do that! 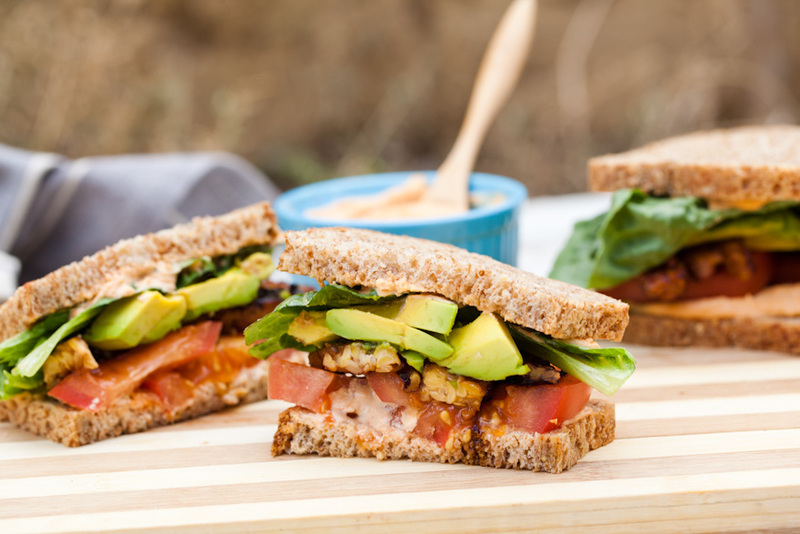 If you haven’t tried this Tempeh BLT but want to save it for later, just pin the photo below! For more incredible vegan sandwiches, check out our Chickpea Salad Sandwich or our BBQ Pulled Jackfruit Sandwich.